How do I go about deleting the cache folder? You open the folder Spaceengine 0.972 and delete the folder that says cache. Hey, does anyone have a manual installer for this yet? I try using the automatics and torrents (every mirror) but the setup doesn't run. I had this problem with the last version, and it was fixed by the manual installer (zip file). I would provide one, but I don't have a good hosting service to use, and my bandwidth is too poor for me to be the initial seed for a torrent that large. Posting again, because you didn't respond when I gave you the log file. Galxies are appearing as strange multicolored lines, and far away star's are in shades of blue and purple, instead of white and red. Put the Diffraction Spikes to normal in the settings. Caan, I'm afraid that I don't have any suggestions for you, other than updating your graphics drivers, and of course making sure your card isn't overheating. This won't work in 0.972, the lens flare code changed and now normal spikes have that same issue. Only simple spikes have the correct color at all times now. I have seen an other little bug. 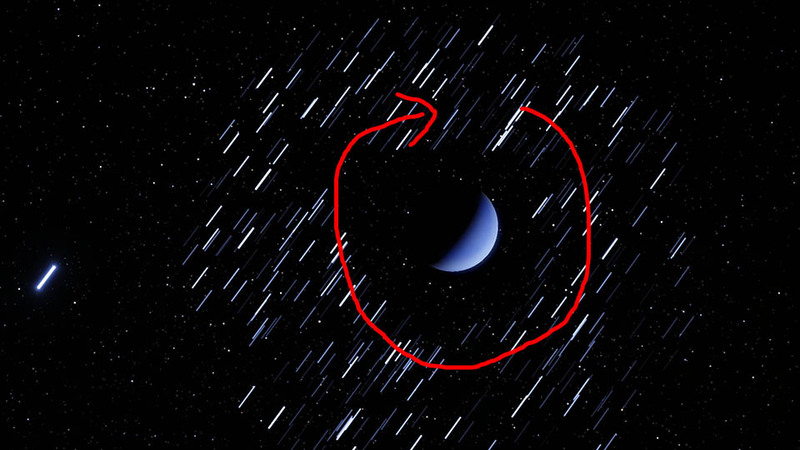 This are asteroids orbiting around a planet with "planets motion blur" on. But instead of blurred circles appear straight lines. 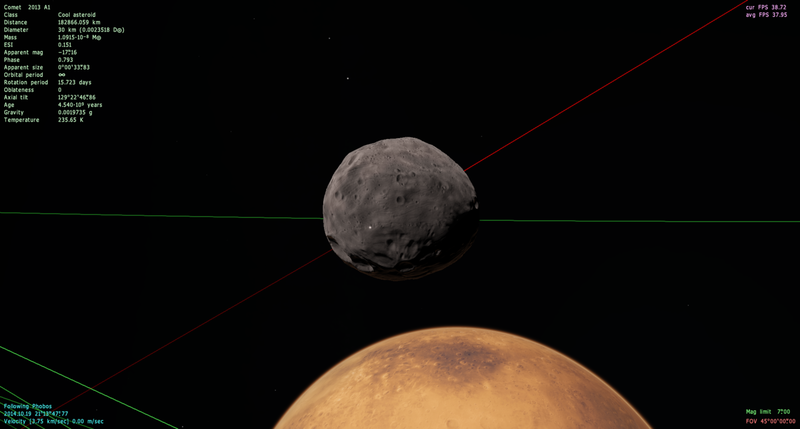 The arrow shows the rotation of the asteroids. first of all of course a big thanks for this christmas present. Been watching SE for a while now, but never had a problem that I actually had to use the forums for... Now I have I think. The problem comes up with the usage of the Shutter glasses 3D mode together with my Nvidia 3D Vision. I already checked if it is working in other software, and is actually is (tested it with the testsoftware from nvidia, and also with games). 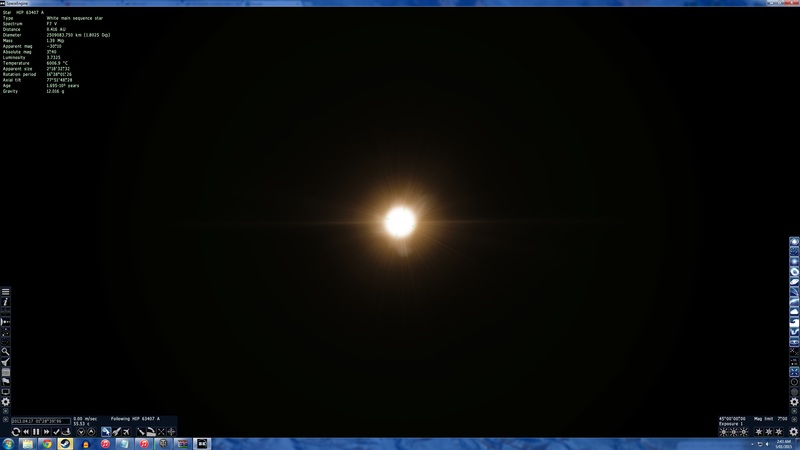 And the Space Engine is also running in fullscreen. My system also seems to recognize that it's receiving an appropriate 3D output (the nvidia 3D vision hardware and the glasses are initialized correctly on startup of SE). The problem is, that even when everything (the hardware and the shutter glasses) are on and working fine, I still get both pictures for both eyes, even though one of the pictures is faint for one of the eyes. It does not seem to be any problem with the reaction time of the screen that shutter 3D may have (as often recognized in pictures with extreme black/white contrast), because I don't get something like that in any other games I use to play in 3D. It seems as if the pictures are send out on screen in a slightly offset timing compared to the "shutting" of the glasses. MalzM, sorry, I can't help. 3D vision is a custom NVidia technology, but I have no 3D vision hardware to implement its support. This is not a bug, this is how system works. It can't render a circles, only lines. They may look like they should not be there, but this is how they are implemented. So it's "just" a regular Shutter Glasses implementation? Then it's my fault, sorry, for some reason I misunderstood it for being made for nvidias solution. Are there plans for nv 3d vision support for the future? You should not use this at all. This is unfinished feature. Why all trying to use it in this version?! It can't render a circles, only lines. But the orientation the lines are rendered in does not match the movement of the objects on the screen, that's the bug he's reporting. The pistol star has a luminosity of 2.5, when it should be at least ten thousand times that.